Who Can You Call For Commercial Water Damage in Mesa, AZ? You Can Call SERVPRO of North Central Mesa for Commercial Water Damage in Mesa, AZ! We can be to your commercial property anywhere in the Mesa/East Valley Arizona within 120 minutes to start the process of getting your property back to preloss condition. 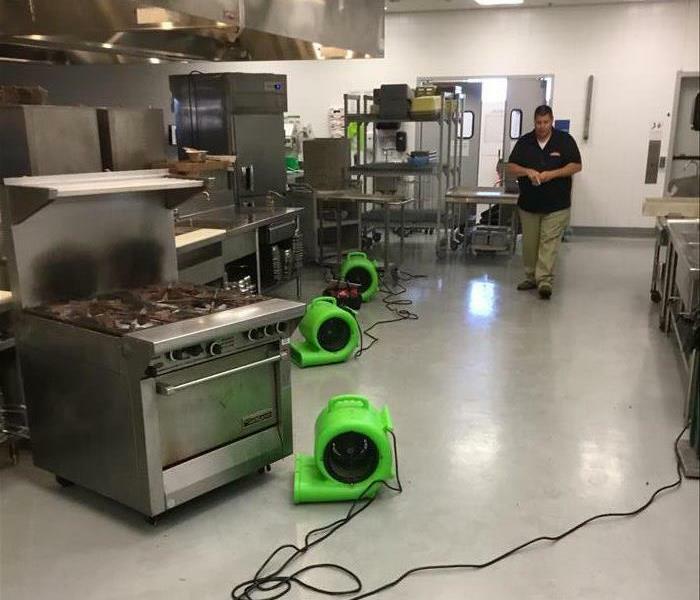 No matter how bad the water damage issue is, SERVPRO of North Central Mesa can handle it effectively and efficiently with our highly trained (IICRC) team of emergency response techs and our water hi-tech and industry-leading extraction and drying equipment. Call us as soon as possible so we can work with you to lower the risk of additional damages and help prevent your water loss from developing into more serious health risks such as mold-related illnesses. Studies show that mold growth can become an issue in as little as 48 to 72 hours from the start of a water damage issue. If your commercial property has moderate to severe water or flood damage, you need a reputable company available on call 24 hours a day in case of an emergency. SERVPRO of North Central Mesa is IICRC Certified and has comprehensive training in restoring your commercial property to preloss conditions! Time of the essence when responding to a water emergency. The faster you respond, the better the chances you will not give mold and mildew the opportunity to grow. Call 480-553-7103 now for water damage assistance. Our emergency response techs will show up quickly and ready to work. Time is a critical factor in limiting the effects of water damage. When water damage occurs, regardless of the source, it should be kept to a minimum if responded to within 24-48 Hours. SERVPRO of North Central Mesa has industry leading cutting edge equipment used to remove excess and/or standing water. We are ready and experienced to respond quickly to any type of water loss – clean, gray or black (Category 1, 2, or 3). A timely response to a water claim can reduce costs and property damage. Who Do I Call for Storm Damage in Mesa AZ? Arizona homes face many types of significant structural damage risks thanks to Mother Nature. Although we’re not at risk of hurricanes or even earthquakes like the midwest and back East, you just don’t know when a natural tragedy can strike or what it will consist of. 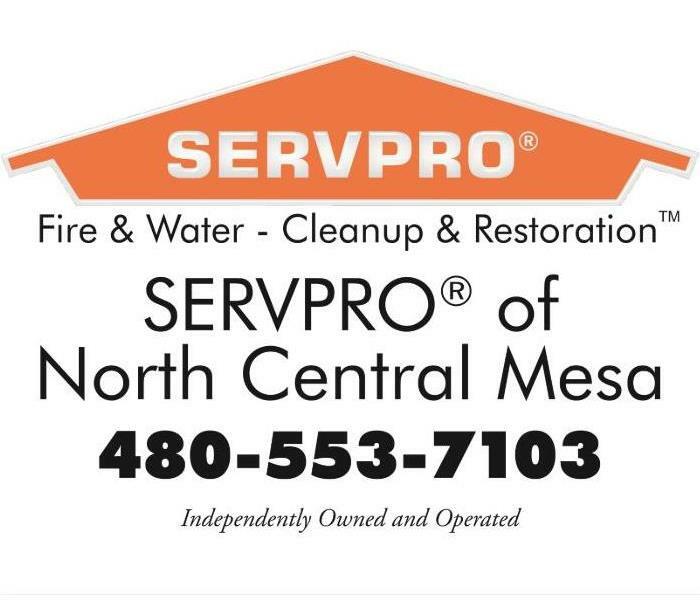 SERVPRO of North Central Mesa has been helping the residents and business owners of Mesa and the East Valley get their properties back to normal following a natural disaster. We respond quickly to determine the damages and begin debris removal, water extraction, cleanup, as well as reconstruction for residential and commercial properties. Our certified technicians provide theemergency services you need when your residential or commercial property is damaged by monsoons, floods or other natural forces. We are ready and on call to help any time of the day or night. Call us 24 hours a day 7 days a week any day of the year. We have a 1 hour contact, 4 hour on site arrival, and 8 hour full update guarantee for every call we get! Mesa area storms can cause unexpected roof damage to residential and commercial properties. Hail damage to properties can be very costly to repair and can cause future water damage from leaks unless the damage is fixed quickly. It can be tricky to document hail damage, so an immediate inspection is imperative. Insurance companies require very specific information on the extent of the damage, often even looking for a minimum number of hail strikes on a roof before authorizing repairs. SERVPRO of North Central Mesa is available 24/7 to make sure hail damage to your properties in Mesa and the East Valley are inspected and documented quickly and accurately. 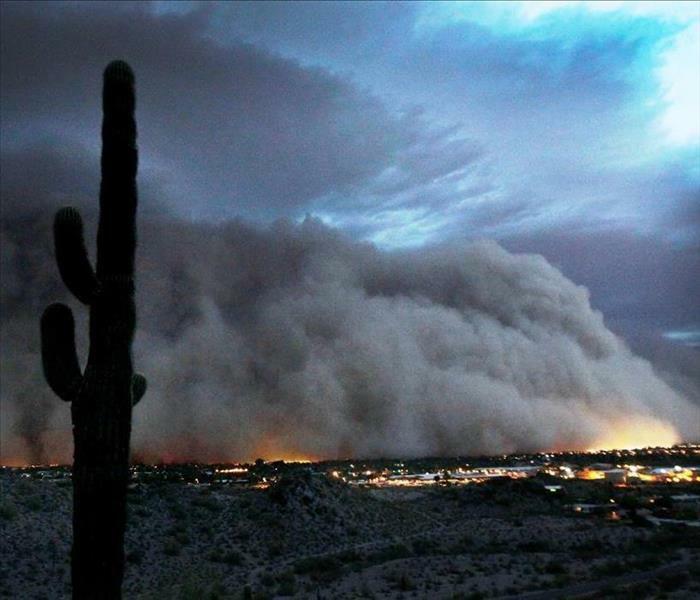 Mesa is affected every year by monsoon rains that leave residential and commercial property owners dealing with the results of flooding, high wind damage, and increased humidity. Immediate response times to emergencies with water damage is needed to reduce the exposure to secondary damages. Property owners dread the possibility of mold and mildew, and the longer these remain undetected and unattended to, the more expensive their damage becomes to correct. SERVPRO of North Central Mesa’s IICRCCertified Technicians have extensive experience with every type of storm or water-related damage and we are available 24/7 to give immediate attention to you and your property. YOUR HEROES ARE ON THE WAY! SERVPRO of North Central Mesa works closely with your insurance company to get your property safe and clean after hail or storm damage. SERVPRO of North Central Mesa has a solid working relationship with most National and local insurance companies, plus an A+ rating from the Better Business Bureau. During an inspection, storm damage, including hail, wind, and water damage, are documented carefully with attention given to the specific information that insurance companies’ adjusters need in order to file a claim to get money into your hands quicker. SERVPRO of North Central Mesa for our Water removal services in Mesa Arizona. 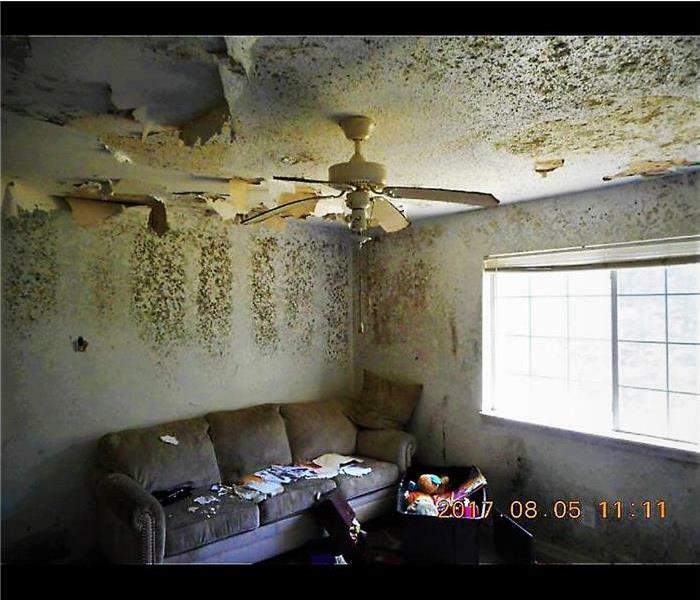 Yes, We Do Water & Fire Restoration and Mold Remediation in Mesa AZ... But we do a whole lot more! 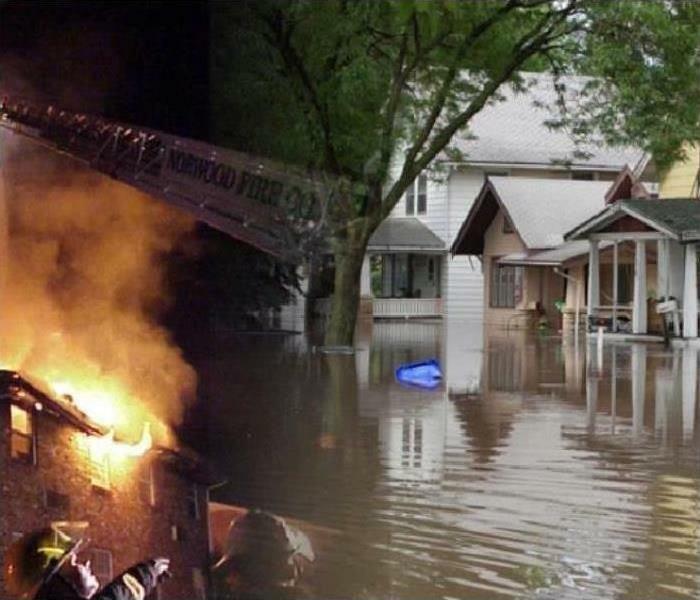 Most people know that SERVPRO handles fire and water damage clean-up and restoration as well as mold remediation. Our 1-4-8 service standard says that we commit to responding to a call from an insurance carrier or call into the Call Center within 1 hour, be on scene in 4 hours and have an update to your insurance carrier within 8 hours to report on the condition of the loss. Because of this SERVPRO is one of the fastest and most trusted restoration companies in America! SERVPRO of North Central Mesa is a locally owned franchise, and we go even further and try to respond to your calls in North Central Mesa, AZ and surrounding areas within 30 minutes and be on scene within 1 to 2 hours! Water damage issues are an extremely time sensitive problem. Water damage clean-up costs generally average between $1000 to $4000 depending on the area affected and the length in time it takes for a professional to get on scene to start the clean-up. Additionally, the longer an area stays wet, the higher the chance that mold will surface and become a problem. That causes a significant increase in the cost of the clean-up as well as the time it takes to restore your home or business to its original condition. We use the best equipment and most innovative approaches to dry out water damage issues quicker than anyone else. Along with being on scene within 1 to 2 hours, this experience gives us the best chance to keep your water damage losses to a minimum! Our dry out times is generally within 2 to 3 days for a project that it would take most companies 4 to 5 days. Our goal is to have a dry out completed within 48 hours. Our 24-Hour Emergency service provides you with peace of mind. If your crock pot (or slow cooker) causes an electrical fire in the middle of the night, we can be there in a flash to get working on cleaning up any time of the day or night so you can get back to living your life as quickly as possible! According to the IICRC (Institute of Inspection Cleaning Restoration and Certification) “Ash and smoke, if left unhindered, will cause extensive corrosion, etching, and discoloration, not to mention lingering powerful odors.” The IICRC requires it’s registrants to take extensive coursework in fire restoration techniques before they are certified. SERVPRO of North Central Mesa is IICRC certified For Fire, Water clean-up and mold remediation. There are over 100,000 different types of mold spores! We breathe them into our lungs every day. Most people don’t know that all kinds of mold aren’t dangerous. In fact, there are only a handful of those mold spore types that are hazardous. The MBL (Mold & Bacteria Consulting Laboratories) lists hazardous mold types in three categories. You can see these categories and their definitions here: https://www.moldbacteria.com/mold-types.html. It is essential to make sure that when you are taking care of mold in your home or business that you are using experts who have extensive training in how to identify different mold types and how to eradicate them to protect your structure and your health. SERVPRO of North Central Mesa technicians are IICRC certified for mold remediation and have been trusted to help hundreds home, and businesses owners in the Mesa, AZ and surrounding areas take care of their mold problems for over eight years! In addition to what you already know about Did, you know that SERVPRO of North Central Mesa also Provides the following Services? One our of recent Mold Jobs. You don't want this in your home or business. Give SERVPRO of North Central Mesa a call today. Generally, as a preventative measure, we recommend that homeowners get Air Quality Testing done once per year. However, there are certain conditions that would indicate that you should have your home's air quality tested as soon as possible! Professional Air Quality testing can be expensive (averaging around $300), but catching an issue such as a mold problem early can save thousands of dollars! We suggest putting away $25 per month and getting a test done at the end of the year. And now what you all have come here for! You find a mold spot. You may be tempted to use a DIY home test to test the mold, but those tests only give you information on specific surface spots. Professional testing gives you a lot more useful information that can help you stave off a major mold problem. It can also tell you if you need professional mold remediation. You notice an old or stuffy smell, or you see that your house smells different than usual. This could signal a mold problem or it could be something else such as water damage (pre-mold water damage), old or damage carpet, etc. It's always best to know what you are dealing with in that situation. There has been chimney damage or reconstruction. If repairs or reconstruction has been done to the chimney in your home and it wasn't done correctly smoke from your fire could have problems escaping your house. This could cause smoke damage to your home. More importantly, though, that could cause respiratory and breathing issues for your family, especially if someone in your home has breathing issues such as asthma. A complete blockage is much more noticeable than limited air flow blockage. These issues can be detected when a professional air quality test is performed. You notice that your air is not circulating naturally. When air is not circulating properly in your home, it can have a negative impact on your energy bill. This is something that can really hit your bank account over time. Not only that, but stagnant air can become a breeding ground for germs and create an environment that increases your chance of getting sick or getting over being sick. You have noticed a general change in your health. Having your home or work's air quality tested every year may seem like a costly nuisance, but it is well worth the trouble and the cost considering what you could be dealing with if there are health or home issues that go on undetected. If you have any questions about getting your air quality tested, please feel free to reach out to us at (480) 553-7103. We don't do testing ourselves, but we can be your unbiased 3rd party consultant. What SERVPRO's Cleaning technician can do for you. We make things look "Like it never even happened." What can SERVPRO offer to its customers? Carpet Cleaning is a service that helps with your home or business maintenance. Each room that has carpets should be professionally cleaned at least once a year. A clean carpet that is treated by a dedicated division of specialized and trained professionals prepared to take care of you and your floors properly. We also offer carpet cleaning services in Santan Valley, Tempe, Fountain Hills, Gold Canyon and beyond. Smoke, cooking oil, bacteria, and dust mites all collect in your carpets damaging the fibers some shampoos and detergents might cause further damage. Only a deep clean, by professional carpet cleaning with certified technicians, can preserve the life, color, and beauty of your investment. SERVPRO of North Central Mesa uses some of the most advanced technology such as a truck-mounted carpet cleaning system which can remove even the most ground-in dirt, odors, and of course those hard to remove stains leaving your carpet looking good as new with a fresh smell. Our thoroughly trained and certified technician will inspect any problem areas with heavy foot-traffic, pet stains, and odor, to decide on the most appropriate method of cleaning your carpet. After applying a Pre-treatment, we use our specially-engineered treatment a Chemist at SERVPRO Corporate has created. Then our truck-mounted vacuum system can extract loosened dirt and soils. Our technicians can also apply special treatments such as deodorizers and some protective coating that resists soil and prevents staining and extends your carpet cleaning service. When you are looking for professionals to take care of you and your flooring, give SERVPRO a call (480) 553-7103. The apartment was sure there was a smell coming from a building, I think it might be some Mold growth. Need a Mold removal company? Here we are. Mold or growth as we call it here at SERVPRO of North Central Mesa can be very hazardous although not all mold is equal. No two mold jobs are alike, no two Fire jobs are alike, no two water jobs are alike, neither are forensic, biohazards, or hoarding cleanup jobs none are just the same as the one before it. Before shows like A&E "Hoarders" or "Buried Alive," hoarding is the relatively unknown mental illness. Reality TV shows the worst-of-the-worst of these situations. TV blows things out of proportion. They want all the eye's on their show and don't want you to look away for even an instant. It's like a train wreck; they want to show the gross parts just enough to keep your interest. So really how accurate are all these different shows? Most will agree to watch a tv show documenting a crew attempt to clean out a disaster scenario is not an accurate depiction of what goes into jobs such as storm or water damage that was left untouched and has cause mold growth, or the most common area of mold growth, the bathroom, from lack of proper ventilation. Hoarders come in all shapes and sizes, involving many different types of items from trash to treasures, like rare books and other contents. You can find a hoarder in any place from the cheapest apartments in town to the most expensive neighborhoods. If your friends, family, and loved ones have a hoarding problem and you need someone to come trash out the place for you to start from square one, you know who to call. The water damage restoration company SERVPRO of North Central Mesa. Mold Clean up and Asbestos removal. Levi Frost, and Adam gearing up preparing to take on the mold growth. 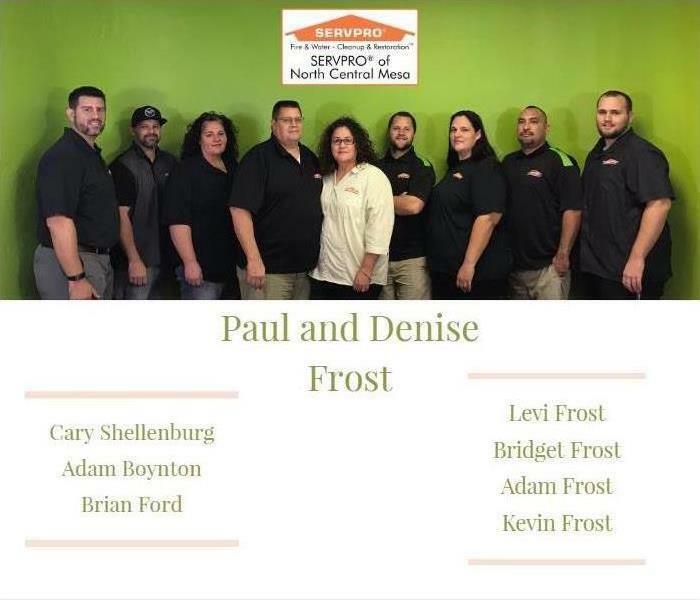 SERVPRO of North Central Mesa has a team of highly qualified individuals that can help remove some of the worst smelling and hazardous material. Like mold growth or Asbestos. We have been educated through IICRC and from the SERVPRO corporate headquarters in Nashville Tennesse. With thousands of hours of experience to rely on, you can trust our team to make any situation better almost, "Like it never even happened." This photo depicts a specific situation that required an emergency arrival on the scene after hours. The tenet was a pregnant mother that had found mold surrounding her dishwasher in the kitchen. The growth needed to be taken care of immediately because of the risk to the mother and child. She was only the tenet, although the apartment complex wanted it taken care of just as much as she did. 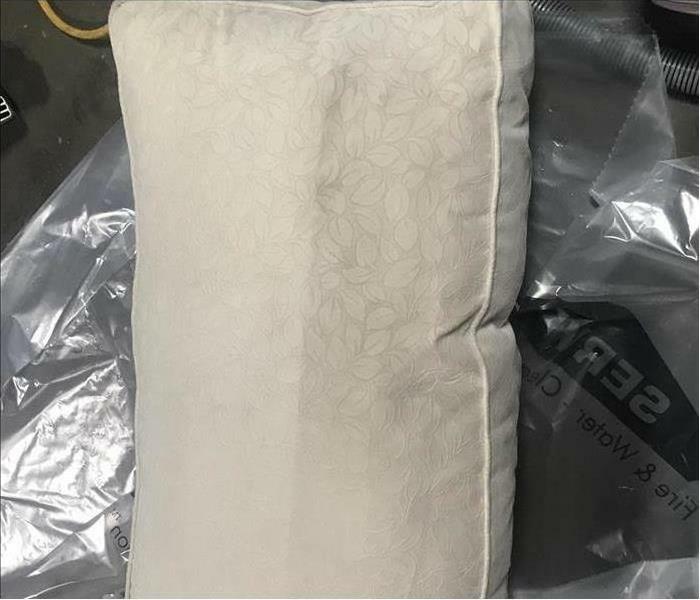 With a little help from SERVPRO, the Apartment complex was happy to know that the ongoing mold problem is solved, and the mother was grateful for how quickly we responded. Office staff that is here when you need them most. 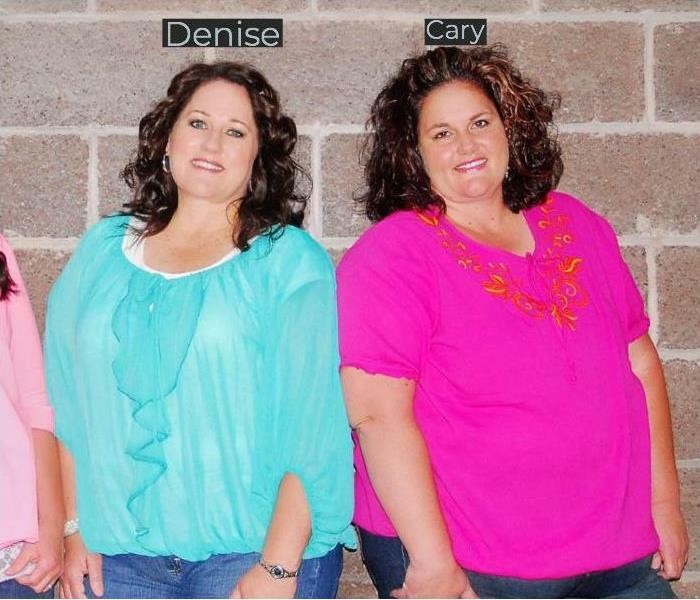 These SERVPRO sisters are here to help! SERVPRO has always made it a point, to be prompt, courteous, and have a human answering the phones at all times of the day. Here at SERVPRO of North Central Mesa, we have a fantastic office staff that will answer the phone 24/7. No one knows when an emergency with happen, so we are always prepared for the worst. Our office manager Denise Frost is one the kindest sweet hearted people you can talk to, and Cary the other office personnel are well versed in the restoration industry with years of experience. Both Cary and Denise have field experience and work close to the employees to stay on top of scheduling and taking phone calls. Cary works quickly and effectively to collect all necessary information and dispatch to the right people. If you have any questions, that may not be an emergency, but that need to get answered Cary and Denise are there to help. You can reach the office staff at (480) 553-7103 during the regular work week hours. SERVPRO of North Central Mesa is growing. We've recently brought on two new employees and are still looking to hire more. If you or a friend need some extra work, we are always looking for qualified people to join our Families franchise. We are currently at nine employees and are looking to expand our production team. We do require a background check, although no experience is necessary. We have an excellent training program and staff on hand ready to train you up to our SERVPRO standards. Our hiring process can be a quick process, so if you're interested, please reach out to our office staff at (480) 553-7103. We have been in business for over nine years, and our mission is to have happy customers. The main thing we care about most is the willingness to go above and beyond for our customers. We want them to have the very best experience they can have after going through the emotional rollercoaster of having a Water damage restoration company come into their home. We do work 24/7, so you might be required to work weekends and possibly even holidays. 3/25/2019 - Who Can You Call For Commercial Water Damage in Mesa, AZ? 3/25/2019 - Who Do I Call for Storm Damage in Mesa AZ? 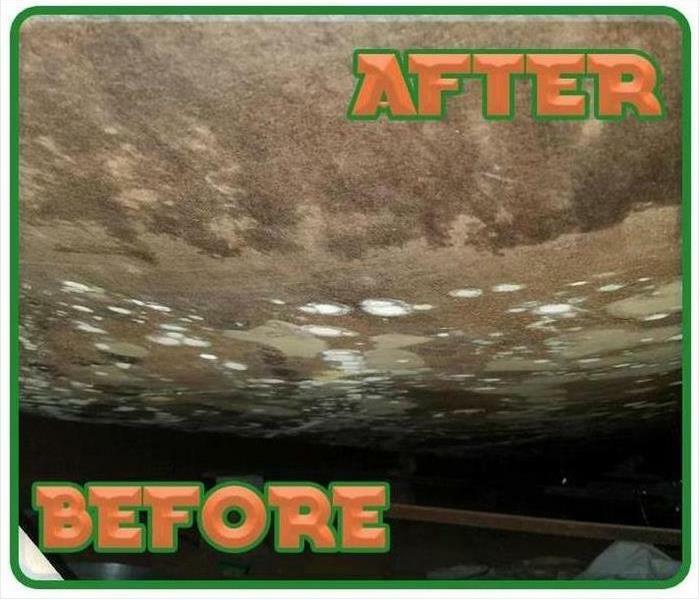 3/19/2019 - What SERVPRO's Cleaning technician can do for you. 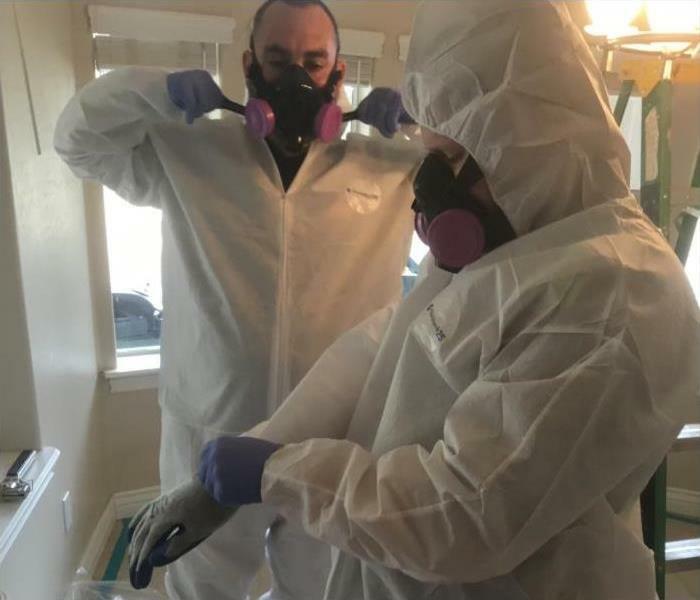 3/14/2019 - Mold Clean up and Asbestos removal. 3/14/2019 - Office staff that is here when you need them most.